Nuevo Latino never tasted as cool, hot, and delicious as it does in this sophisticated new cookbook. It's the first to explore in depth the popular South and Central American specialty of fish and seafood marinated in citrus, herbs, and spices that's taking restaurants by storm around the country. Argentine chef Guillermo Pernot presents fabulous recipes that make the most of both raw and cooked fish and shellfish, as well as fruits, vegetables, and even beef. Salads, salsas, croquetas, chips, and other savory accompaniments from Pernot's acclaimed restaurant Pasión!, which John Mariani, food and travel writer for Esquire magazine, called perhaps the best exemplar of Nuevo Latino food in America, round out the savory mix. 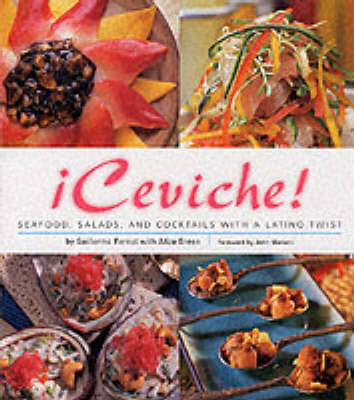 Recipes include Bahian Lobster Ceviche with Passion Fruit Mojo and Grilled Papaya Salad, Argentinean Beef Roll Ceviche, and Crispy Mango Chips.